President Trump spoke at his first annual National Prayer Breakfast. What he said was awesome! What the media reported was disgusting. 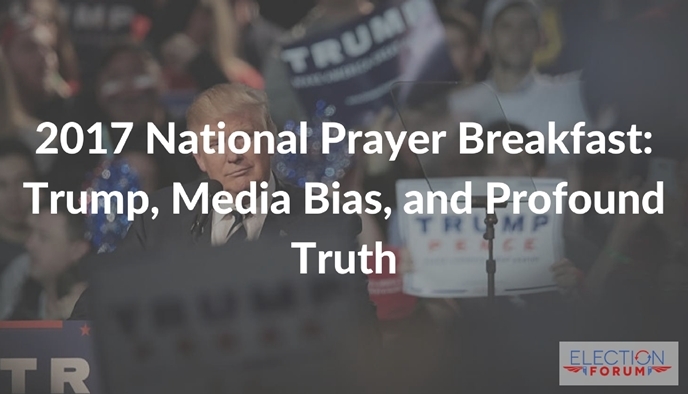 Pastor Rick Warren of Saddleback Church in Orange County, California also spoke at the National Prayer Breakfast. In his speech, Trump praised staff and attendees. He spoke at length about William Ryan Owens, a Navy SEAL who was killed in Yemen. He also stressed his strong commitment to protect religious liberty and this country’s needs to seek God and ask Him for wisdom. What was really remarkable, though, was how well Trump echoed Reagan’s commitment to strengthen this country’s commitment to Biblical principles. “Of the many influences that have shaped the United States into a distinctive nation and people, none may be said to be more fundamental and enduring than the Bible. I was very happy to see President Trump’s enthusiastic participation in the National Prayer Breakfast. His good attitude and promotion of prayer, both before and after the election is very encouraging. But Chaplain Barry Black’s use of Matthew 18:20 was out of context. That verse is a reference to church discipline, not about two or more gathering for prayer.